The great herd on the Arkansas [River] through which I passed ……. was, from my own observation, not less than 25 miles wide, and from reports of hunters and others it was about five days in passing a given point, or not less than 50 miles deep. From the top of Pawnee Rock I could see from 6 to 10 miles in almost every direction. This whole vast space was covered with buffalo, looking at a distance like one compact mass, the visual angle not permitting the ground to be seen. I have seen such a sight a great number of times, but never on so large a scale. -from “The Extermination of the American Bison” written by William T Hornaday in 1889. One of my pet peeves is the assertion — that I read so often in the writings of well-meaning but poorly informed people commenting on the food system – that livestock production is wasteful of land, water and resources badly needed to feed people. 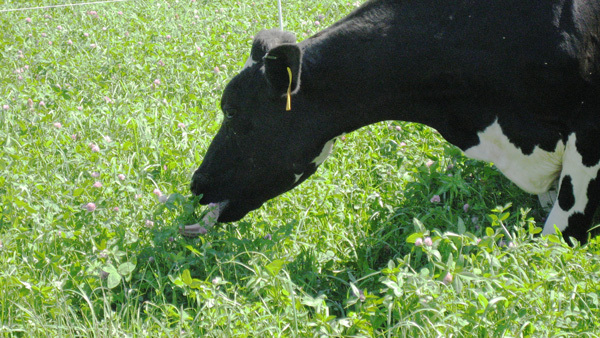 Popular convention in the UK and elsewhere says that grass should be grazed at the three-leaf stage. Beyond this, it either puts up a seedhead or, as it puts out a fourth leaf, the first one dies, so three is the magic number. Popular convention may be wrong! A panting cow may be a sign that not all is well within. Whilst I was at Greg Judy’s mob grazing school, nutritionist Mark Bader explained the role of nitrogen in the diet, and how an excess of it, in the form of urea, reacts with the haemoglobin in the blood and reduces the blood’s oxygen carrying capacity. He says cows breathing hard is often a sign of too much protein in the diet, something they get from grazing pastures when they are all leaf and hence high in protein, rather than a combination of leaf and stalk, when the carbohydrate:protein ratio starts to become more balanced. The cows pant harder and harder in an attempt to get enough oxygen to their muscles. 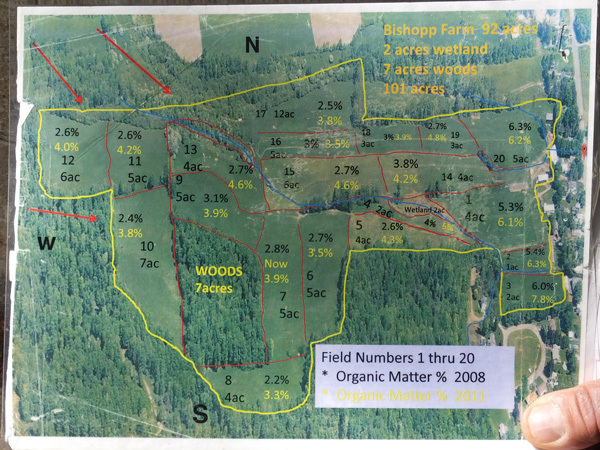 ‘Farming in Nature’s Image’ is a simple and very successful concept. It means working with nature, making decisions based on what would happen in the natural world if Man wasn’t interfering. 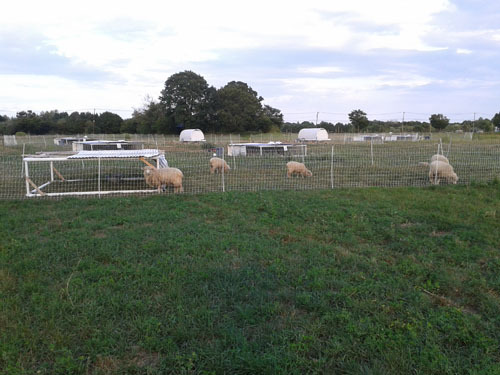 Mob grazing is one example – I’ve already talked about the massive herds of grazing animals that used to roam the grasslands of Europe, Asia and America and which mob grazing, albeit on a small scale, tries to emulate. I have a question for cattle farmers: What do you sell? The chances are, your immediate answer would be something along the lines of “Store cattle!” or “Beef!” or “Fat cattle!” Wrong. Try again…..
Hmmm, how about “Grass?” Getting closer….. When it comes to agriculture, every state seems to have its rivalries. In Illinois and Iowa, bragging rights over which grows the most corn are serious business at harvest time each year. In Vermont, it is milk. 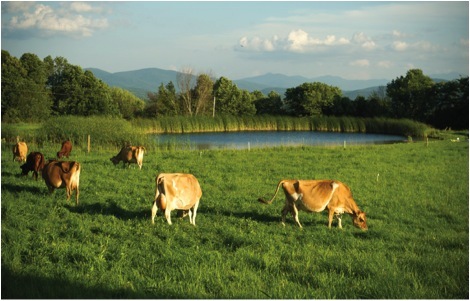 Addison County, west of the Green Mountains and centered around Middlebury, claims the most dairy acreage. But Franklin County, at the extreme northwest of the state bounded by Lake Champlain and Canada, wins the contest for number of dairy farmers. One of those, proud proprietor of Stony Pond Farm in Fairfield, is Tyler Webb. Not a farm kid himself, Webb, now 39, grew up in Rochester, NY. When done correctly, livestock grazing can create many benefits for the environment, plants, soils, animals and farm income. 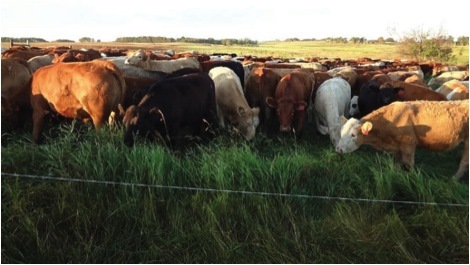 Pasture plant quality and soil health can improve, animal welfare can benefit, feed costs can go down, animal performance can increase and farm finances can become more sustainable. Good grazing management can change pasture plant species without tillage and reseeding, by just using animal impact from grazing. This can convert weedy brushy pastures, where animals have to search to find good quality forage, into highly productive pastures, which feed more animals higher quality forage. These improved pastures provide low cost, high quality feed, which is particularly helpful for farmers facing rising feed and fuel costs. 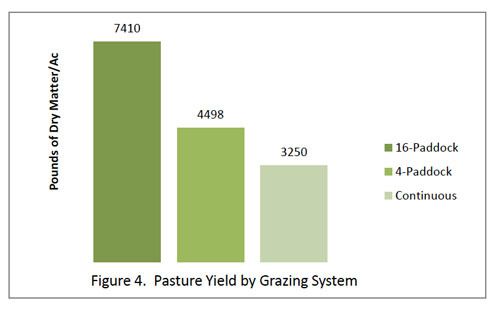 With high quality pasture in the ration, farms can decrease the amount of purchased grain and forages. Other cost savings can come from having cows harvest their own feed instead of paying for fuel needed for mechanical harvest, storage and feeding. 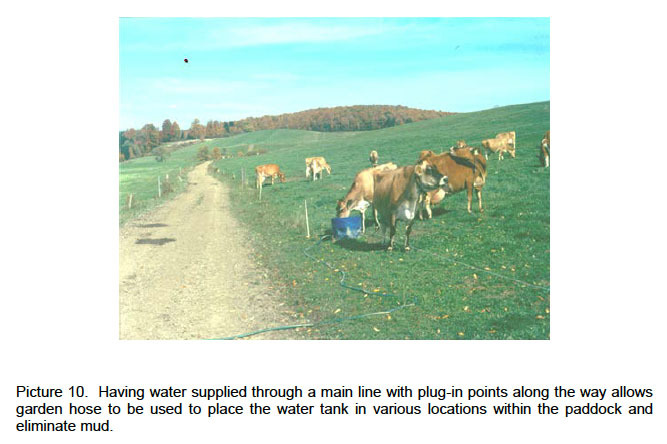 [Read more…] about What is Good Grazing Management? Agriculture is still one of the largest industries in New York state. It contributes 5.7 billion dollars to the economy each year, and occupies almost a quarter of the land area. That importance is obvious as one travels through central New York along the Mohawk River and the route of the old Erie Canal and sees the gently rolling hills, large fields, and occasional barns and farmhouses. 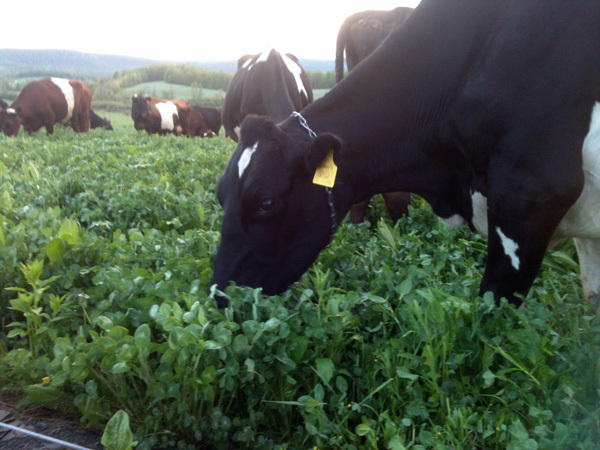 Growing demand for grass-fed dairy products is encouraging more farmers to try zero grain rations. 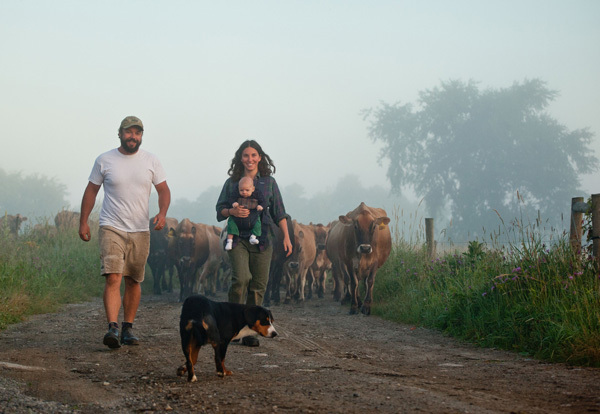 Organic milk buyers are now paying a premium for this “Grassmilk”. In addition, some dairy farms direct marketing raw milk or farmstead cheeses are interested in zero grain dairying. When a prescribed grazing management plan is being developed, there are several important factors to consider.